Self-confidence is essential to good leadership. If you doubt this try imagining people following a leader who was unsure of where he/she was going. In no time there would most likely be arguments and squabbles in the team. But this is only one small example of the need for self-confidence in leaders. The person in front needs self-confidence to empower their judgement, enable them to communicate confidently, to enable them to make friends with the people around them at all levels, to provide the courage to face up to tough situations and for a hundred and one other reasons. One of the issues that we all have with self-confidence is that it waxes and wanes according to where we are, who we are with and the subject with which we are dealing. For this reason we all need to be able to exert control over our self-confidence. We cannot rely on it to be always at the high level that we wish it to be. 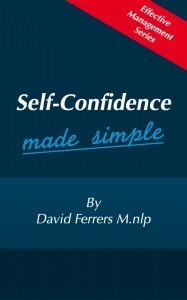 In order to enable you to be able to regulate your self-confidence in any situation I provide a number of exercises that you can do to ensure that you can always feel self-confident in my new handbook Self-Confidence Made Simple.